Location: East central Niagara County, northeast of the City of Lockport. Starting from the intersection of Old Niagara Road and Route 78 (on the northeast side of the City of Lockport) continue north on Route 78 for 0.8 of a mile to Slayton Settlement Road. Turn right (east) on to Slayton Settlement Road and on roughly 0.9 of a mile turn right (south) into the entrance for the Town of Lockport Nature Trail. Toenniessen Falls is best seen in the mid to late spring as the creek may dry up completely by mid summer. The trail head starts at the entrance gate on the south side of the parking area. From the gate proceed southward for roughly 0.3 of a mile and turn left (east) on to a side trail. The side trail passes along the edge of a small meadow with bird houses and soon enters the woods. In about 1,300 feet you will pass a large Oak tree on your right. The tree is believed to be around 200 years old. Continue along the trail with the creek, an unnamed tributary of the East Branch of Eighteenmile Creek, on your left. 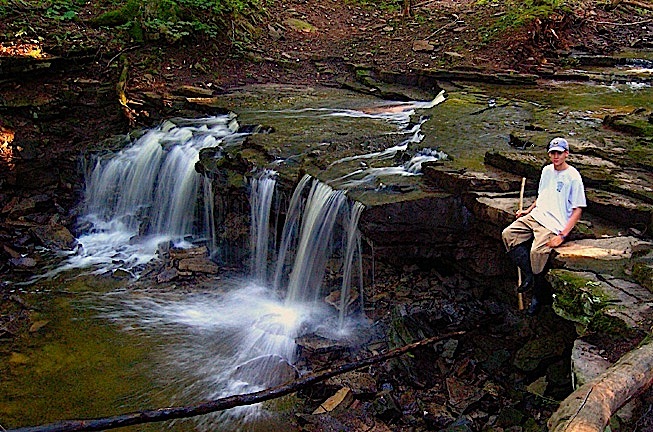 In roughly 800 feet you will arrive at Toenniessen Falls. The Falls is 6 feet high, 20 feet wide and faces to the northwest. The purpleish-red bedrock of the creek is a sedimentary rock known as Medina Sandstone. It dates from the Silurian Period and is about 18 feet thick. You can return to your vehicle by retracing your steps or continue to explore the trails in the park. For a park brochure and trail map check out the Town of Lockport Nature Trail web site listed below. The trails are closed during deer hunting season (mid November). For a MapQuest map of the area clickhere.